Laundry) and I (Sensational Creations) started our blogging journey. It seemed only fitting to celebrate our accomplishment with some of our bloggy friends, and have a giveaway with a few of our favorite things from this year. Things that have helped us grow and encouraged us along the way. Things that might just encourage another blogger, whether a newbie or seasoned pro. A package to Online BlogCon, our favorite blog conference. A blog design package from Sweet Anne Designs, our favorite graphic designer. The Blogger’s Survival Guide, best reference guide for any blogger. One year Picmonkey Royale Subscription, a photo editing program even non- techies can use. $35 Joann gift card, money for all those blogging projects. 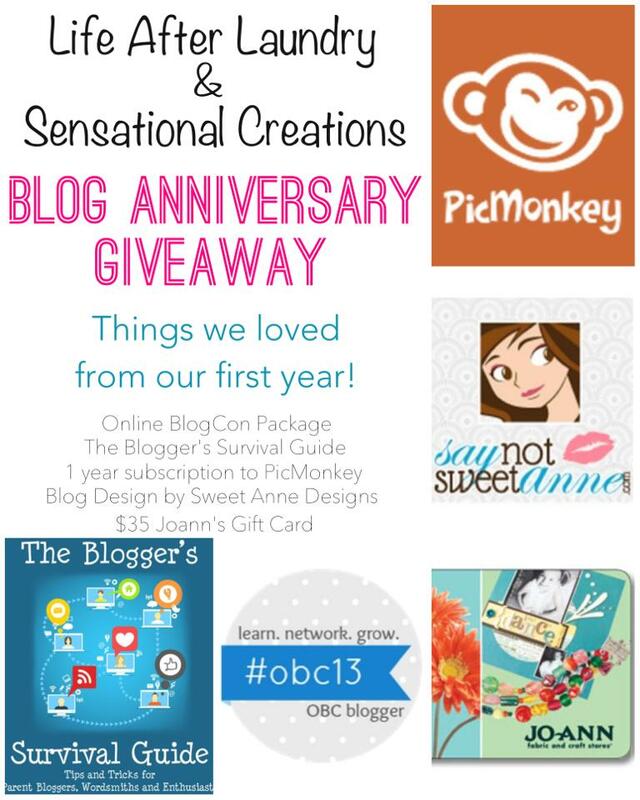 We want to thank our awesome friends who joined us in our celebration by being part of our Blog Anniversary Giveaway. Open worldwide! 5 prizes, one winner takes it all! Blogiversaries and other milestones are always so encouraging. 🙂 Big congrats from me to Brenna and Mariely. Good luck for the next blogging year to the hosts of this giveaway.